Pot in Pot Cooking Method for Pressure Cooking: Using the method of cooking in one pot inside your Instant Pot. This technique is used for baking in the instant pot, dishes that are rich in dairy, or to cook more than one recipe at a time inside your pressure cooker. 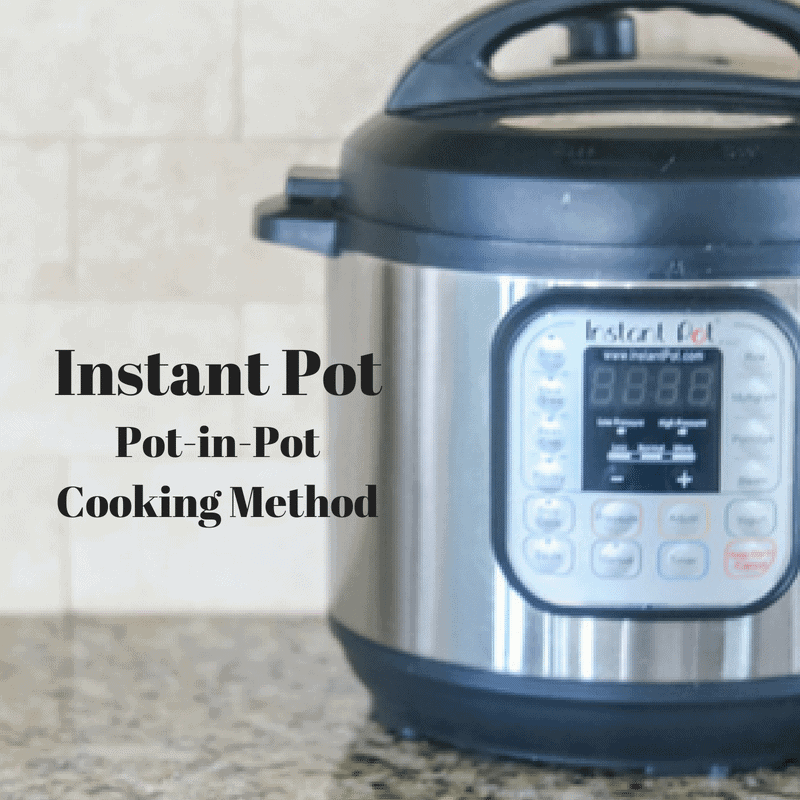 If you have been browsing the internet looking for Instant Pot recipes, you may have heard the term ‘Pot in Pot’ and wondered what it is. Pot in Pot cooking (also referred to as PIP) is a useful Instant Pot technique. What is Pot in Pot? Pot in Pot method of cooking allows food to cook in a separate bowl that’s placed on a steam rack in the Instant Pot. Steam generated from liquid below the steam rack is used to build pressure and cook the food. How do you use Pot in Pot Method? Place a metal trivet or steamer rack in the water. Put food in an oven-proof container. This container does NOT require liquid. Place the container on the steam rack and close the Instant Pot lid. Cook and release pressure as recipe directs. Recipes that don’t require liquid like meatloaf or cake. A recipe that has a thick gravy or sauce. Recipes that require a water bath or “bain marie” like such as cheesecake or creme brulee. To cook two recipes separately but at the same time. A dish that contains dairy, such as oatmeal. A recipe that does not use a lot of liquid–like a lasagna. If cooking two recipes at the same time, be sure both recipes have the same approximate cooking time and are cooked at the same pressure level and use the same release method. A dish wrapped in aluminum foil make take 1-2 minutes LONGER when pressure cooking. A dish cooked in glass or silicone may also take an additional 1-2 minutes longer than a stainless steel container as well. Be sure to use OVEN SAFE dishes for PIP cooking methods. Never put a frozen pot into your instant pot. The change in pressure will cause your frozen dish to shatter. You will need a wireless rack to raise the pot above the bottom of the inner pot. 7 inch cake pans and cheesecake pans will fit perfectly into 6 and 8 quart pressure cookers.